Southwest Ledge Lighthouse in New Haven, Conn.
About a mile offshore from Lighthouse Point Park, in New Haven Harbor. You can get good views with binoculars or good photo lens. Southwest Ledge is a dangerous rock formation about a mile offshore entering New Haven Harbor. 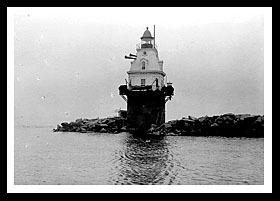 New Haven became a major industrial center in the middle 1800’s establishing the need for South Ledge lighthouse to be established in 1877 to guide the increasing traffic from the dangerous ledge. The eight-sided architectural style with its cylindrical base was unique so that ice flows would not jam around the base area during the winter months. Assistant Keeper Sidney Thompson was credited with saving four people in the 1880’s. From 1914 through 1924 the keepers during those years were credited with saving the lives of at least 20 people. Keepers often complained of the constant wet conditions and cockroaches. The quarters were also cramped and eventually lead Assistant Keeper Nils Nilson to go berserk. One night, after a minor disagreement, he grabbed a fire ax and chased Keeper Jorgen Jonnensen around the tower where Jonnensen barricaded himself into a storage room. Another incident involved Nilson pinning Jonnensen against the wall threatening to cut his throat with a butcher knife. This time, Jonnensen was saved through the intervention of his brother-in-law who stayed at the lighthouse. Shortly after, in 1908, Nilson went ashore and took his own life. New Haven, home to Yale University with its cultural events, offers a variety of parks including the Lighthouse Point Park, where you can view the lighthouse from a distance, and enjoy a close up view of Five Mile Point Lighthouse. The lighthouse is best viewed by private boat. Many attractions in New Haven have to do with connections to Yale University, helping New Haven to become the cultural center it is today. There are all kinds of performances and exhibits in the arts and theater, and many forms of music. You’ll also find the Yale Bowl for college football. There are museums of natural history and New Haven history, architecture from the nineteenth century, and many specialty shops. Follow lighthouse park signs to the 82 acre park for plenty or recreational activities. Southwest Ledge Lighthouse can be viewed about a mile out from the park, but is still best viewed by boat.